I am pleased to announce that the first ARM processor is now supported by the USB Host library. 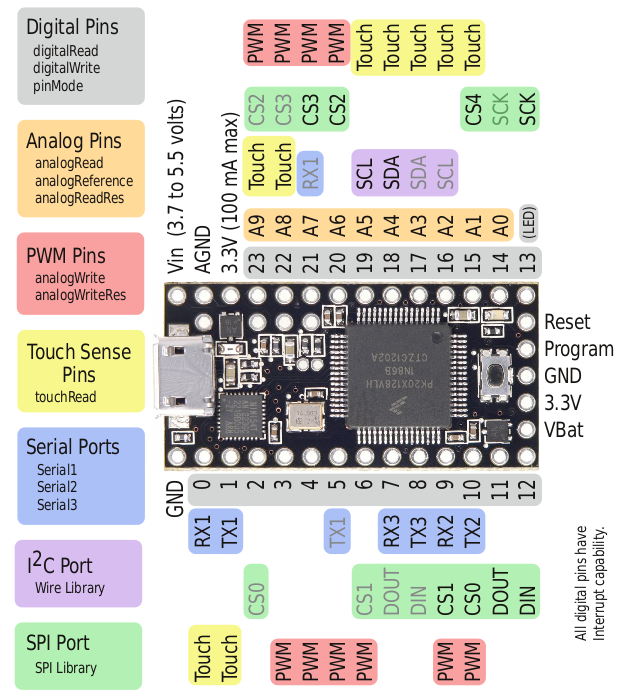 It is the Teensy 3.0 which features an 32 bit Cortex-M4 ARM processor running at up to 96MHz. This is a huge increase in speed if you are used to the Arduino Uno running at 16MHz. The Teensy 3.0 is created by the Paul Stoffregen which is also a dedicated contributor to the Arduino IDE. If you are looking for a ARM based board for your next project, I recommend taking a look at the Teensy 3.0. A more detailed overview can be found at the official page. To use the Teensy 3.0 with the library I recommend using the Mini variant of the USB Host Shield as it is much more compact and a bit cheaper too. Since the Teensy 3.0 is running at 3.3V no logic conversion is needed. Note it is very important than you do not connect a 5V microcontroller to the Mini variant of the USB Host Shield, as this might damage the board. If you are planning to use a 5V microcontroller like the Arduino Uno I recommend getting the full sized version of the shield. The images to the right shows both the pinout for the Teensy 3.0 as well as the Mini USB Host Shield. Furthermore I recommend cutting the VBUS jumper and then soldering a wire from the provided pad on the USB Host shield. This wire can then be connected to the VIN on the Teensy 3.0. The USB Host shield will then get powered directly from the same USB port as the Teensy 3.0 and the VBUS will be 5V as required by most devices – note that you might need a separate 5V regulator depending on which device you are using with the shield, as it might draw too much current. More information about how to modify the shield can be found at the hardware manual. Also take a look at the guide for the other Teensy boards, as the wiring is almost the identical. Hopefully this is just the first of many ARM based boards that is going to be supported by the USB Host shield library. If you got any questions or comments, then feel free to write a comment below and I will answer as fast as possible. Both the Teensy 3.1 and Arduino Due is now also supported by the library. Many people asked me to post a video showing an arm from inverse kinematics article in action. While making a video, I realized that shots of the arm following a pattern of computer-generated coordinates is going to be less than exciting and decided to add manual control. The video below shows the result. In addition to the video, a HID introductory page has been written describing HID communication basics as well as some simple Arduino code. Enjoy! ( Youtube link, where HD quality video can be selected ). Arduino sketch written for this video is on gitHub.